Use the 4-wire resistance method, as shown in the following figure, to measure resistances of less than 100 Ω. The 4-wire method is more accurate than the 2-wire method. The 4-wire method uses four test leads, one pair for the injected current (the test lead) and the other pair for sensing the voltage across the resistor Rmeas (the sense lead). 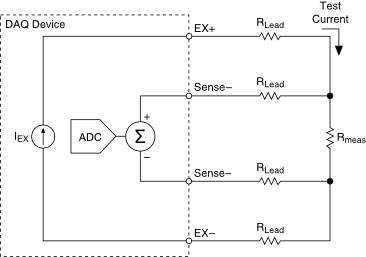 Because no current flows in the sense lead, the device measures only the voltage developed across the resistance. Thus, a 4-wire resistance eliminates errors that test lead and contact resistance cause.